[Gen II] [JOHTO LEGACY] Pokémon Christmas - 2014 Version Released! Thanks man, glad you enjoy what you've seen so far. And speaking of updates, here is a little mock-up map made from a tileset I'm working on right now. I know its only been a day, but bumping my own thread because I want some feedback. What do you guys think of this cave tileset I'm working on? Does it look good, bad, ugly, etc? The dirt/ground would be brown, and the mountain/rock parts would be grey. I like it, but I'm not sure about the ground tiles. Maybe I just need to see them in color before I can really judge. Are the colors identical to ? That is the tileset I devamped it from, so thats the colour scheme I had in mind. 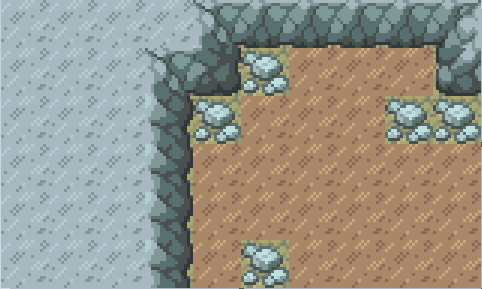 It won't look exactly like that though, it would use the night-time pallets like caves did in Gen II. I'm a little unsure about the dirt tiles myself actually so I may end up changing it. EDIT: Also, here is another thing from the Cave tileset, for the cliff gate in Cianwood City. The dirt tiles look nice here, but would they clash? EDIT: I made a really good mockup. Last edited by MetalKnick; 18th November 2013 at 06:06 AM. @jwibagi - Thanks! I'll be sure to let you know. @MetalKnick - Yeah, that dirt design looks pretty nice. I'll try devamping it and see how it comes out. EDIT: I don't think I ever posted this pic here. I'll go ahead and do that while I'm thinking about it. It is of course the research lab in the Ruins of Alph. After taking that pic, I changed out the carpet in that tileset so it uses my new version like the PokeCenter uses, instead of the default GSC carpet that it uses here. Oh wow, those tiles really give the game a different atmosphere. I can't wait to see them in color!! I devamped (or more accurately just redrew since it was already 4 colors) that dirt and I think it will work nicely. Thanks for pointing it out. Also, speaking of color I decided to open up paint shop pro and apply color to a new teaser pic. This time, its the shrine in Dragon's Den.